Confused about which toothpaste to buy? You’re not alone — we’re all regularly confronted with multiple choices when we shop. But you can simplify your decision-making process by first remembering that toothpaste has one main objective: helping to break down and remove dental plaque when you brush. Plaque is a thin film of bacteria and food particles that if you don’t remove through brushing and flossing could trigger tooth decay or periodontal (gum) disease. Toothpastes contain abrasives and detergents to help make this possible. Abrasives like hydrated silica are gritty substances that work with the mechanical brushing action to loosen plaque. Detergents (usually sodium lauryl sulfate) help loosen and break down particles on your teeth that won’t otherwise dissolve with water alone. The combination of these ingredients and daily brushing action enables you to remove a substantial portion of plaque from your teeth every day. These ingredients (along with others to retain moisture and bind everything together) are the foundation of any toothpaste. There are other additives, however, that you may also want to consider. The most important is fluoride, a naturally-occurring chemical proven to strengthen enamel against tooth decay. If you’re interested in a brighter smile, you can also look for bleaching agents that may help whiten some enamel staining. And, of course, there are various flavors to suit your taste. You’ll also want to pay attention to ingredients if you have special concerns. If you have sensitive teeth, your dentist may recommend particular brands that help reduce discomfort. You’ll also want to be on the lookout for ingredients that you may be allergic to like the aforementioned sodium lauryl sulfate or flavors like cinnamon. Be sure to read the ingredients label if you have known issues with certain substances. And while you’re reading the packaging look for one more thing — the American Dental Association Seal of Approval. This seal means any manufacturer claims for lower occurrences of cavities or other effects by that toothpaste have been independently verified. It can be overwhelming amid all the product messaging to decide which toothpaste is right for you. 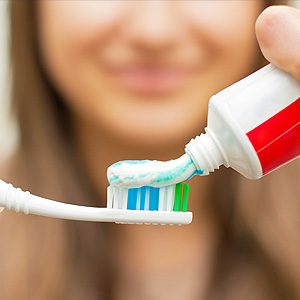 But by knowing these basic facts about toothpaste, you can feel more confident choosing the right one to help keep your teeth and gums clean and healthy.